Because of a lack of archaeological information about the late precontact period in the Maritimes it is difficult for us adequately to describe Mi'kmaq culture on the eve of European arrival in the area. Much of the coastline of the Maritime provinces has been sinking, relative to the sea, and as a result many late precontact coastal sites are now under water. In fact, we do not have good documentary evidence about the Mi'kmaq until the first decade of the 17th century, and by that time the Mi'kmaq had been in contact with European fishermen, fur traders and explorers for about a hundred years. This means that the missionaries and other Europeans who wrote about the Mi'kmaq after 1600 were actually describing people who had begun to acquire European goods and whose way of life may have been significantly different from that of their ancestors. With this caution in mind we can look at the first European accounts of the Mi'kmaq. The earliest reasonably full descriptions were produced by people such as Father Pierre Biard, a French Jesuit missionary who was in Nova Scotia (then part of what the French called Acadia) from 1611 to 1613, and Nicolas Denys, a French trader and entrepreneur who lived in Acadia from 1632 to about 1670. These writers describe a people whose territory included the present-day provinces of Prince Edward Island, Nova Scotia, the eastern portion of New Brunswick, part of Quebec's Gaspé Peninsula, and a portion of Newfoundland. (In the early 20th century, Newfoundland Mi'kmaq informed the American anthropologist Frank Speck that they had occupied the island in precontact times.) Estimates of the size of the aboriginal Mi'kmaq population vary considerably, but it is likely that the figure fell between 10,000 and 20,000. Damien Benoit of Conne River constructing a pair of snowshoes. Courtesy of The Rooms Provincial Museum Division, St. John's, NL. Photo ©1983. The Mi'kmaq spoke a language which was a member of the Algonkian family. It was closely related to that spoken by their neighbours the Malecite and Passamaquoddy, and distantly related to other Algonkian-speakers such as the Beothuk and the Innu. In the early historic period, the fundamental unit of Mi'kmaq society was the extended family, which could consist of a leader (sagamaw) of a group of related people including the sagamaw's immediate family, his married children and their families, and other relatives who lived with him. At times and places where food was plentiful, a number of these local groups could form bands which in the summer could range up to two to three hundred people. On occasion, the sagamaws came together in a kind of council to discuss important matters, especially those having to do with peace and war. A traditional account of the Mi'kmaq people also holds that their land was divided into seven regions and that each region was led by a chief. The Cape Breton regional chief was considered a Grand Chief. It is not clear if this arrangement existed in precontact times, and most authorities believe that Mi'kmaq society was essentially an egalitarian one whose leaders were chosen because of the prestige and status that they had earned. Their leadership, it is argued, largely consisted of being able to create agreement within a band about what to do. Such leadership was particularly important in resolving conflicts within a group, negotiating alliances with other people, going to war with enemies, and making decisions about when and where to hunt and fish. Since the Mi'kmaq lived a bit too far north to be able to depend upon aboriginal crops such as corn, beans, and squash, they relied upon the resources of the forests and the sea. To do so, Mi'kmaq groups had to follow precisely-timed schedules. According to Father Biard, in January they hunted seals on the coasts and off-shore islands, while the period from February to the middle of March was spent inland hunting moose, caribou, beaver and bear. In the last half of March, the people moved out to the coasts and estuaries to catch smelt, and by the end of April herring were available. The spring also brought migratory sea birds and salmon. From May to the middle of September the Mi'kmaq fished and gathered shellfish. Then they moved to the tributaries of the larger rivers to take eel, and in October and November groups moved inland to hunt moose, caribou and beaver. In December, young cod were taken under the ice. It should be noted that this pattern might not have existed before the coming of Europeans. Biard, after all, was describing the Mi'kmaq seasonal round at a time when the people had to hunt fur bearers in the interior in winter when their furs were at their thickest. Similarly, the Mi'kmaq had to plan to be on the coast in the warmer months in order to meet European fishing vessels and to trade those furs for European goods. It is quite possible that the precontact seasonal round would have varied depending on the availability of local resources. Perhaps some groups might have spent more time in the interior than others, while other bands may have lived for much of the year camped at the mouth of one of the larger rivers. 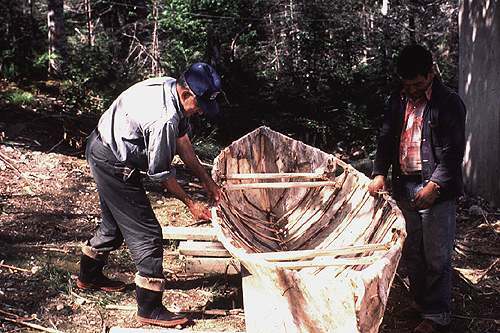 Michael Joe and Martin Jeddore of Conne River completing the construction of a Mi'kmaq skin canoe. This canoe, now in The Rooms Provincial Museum Division, is a replica of the caribou-skin canoes constructed by Mi'kmaq while travelling in the Newfoundland interior. This canoe was built by the Mi'kmaq of Conne River, some of whom intended to paddle it to Cape Breton. Courtesy of Gerald Penney Associates, St. John's, NL. The Mi'kmaq used a variety of weapons and tools to kill and process the game and fish upon which they depended. Spears and bows and arrows were used to take larger animals, while snares were employed to capture rabbits and partridge, and deadfalls were used for predators such as foxes and bears. Birch bark “callers”, which looked something like an old-fashioned megaphone, were used by skilled hunters to imitate the call of a moose. Three-pronged fish spears called leisters were used to spear and hold fish, but the Mi'kmaq also made use of hooks, nets, and weirs. On the water, harpoons were commonly used to take seals. When the Mi'kmaq began to trade with Europeans in the 16th century, they modified some of these tools and replaced others. For example, in the historic period arrows and spears were tipped with iron, rather than bone and stone, and iron fish hooks were substituted for the traditional ones of bone. For travelling, however, the Aboriginal inventions often proved superior to the new European items. Snowshoes, which the Mi'kmaq employed when the snow was deep, were so well-adapted to the North American environment that they were adopted by later European settlers as was the hand-drawn sled known as the toboggan. Europeans also quickly recognized the superior qualities of the birch bark canoe, which was light, seaworthy, and easily repaired. 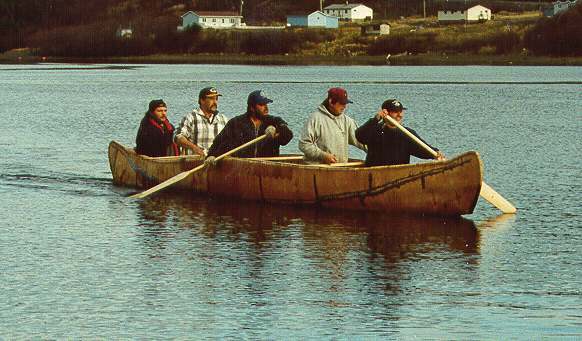 The Mi'kmaq made a number of different types of canoes, some for interior travel on rivers and lakes, and other, larger, sea-going canoes which were capable of making the 100 km or so trip from Cape Breton to the Magdalen Islands or possibly even to Newfoundland. At a very early date, perhaps sometime in the 16th century, however, the Mi'kmaq learned to use small European sailing vessels such as the shallop which would have made long-distance trips much easier and safer. Birch bark was also used at home for containers and to cover wigwams. 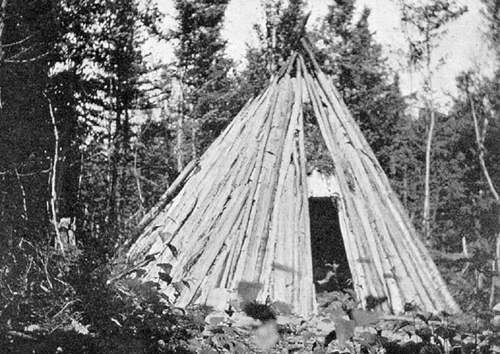 The Mi'kmaq built several types of wigwams, most common was a conical "tipi"-shaped structure made by erecting a framework of poles and covering it with skins or sheets of birch bark. From J. G. Millais, Newfoundland and its Untrodden Ways (London: Longmans, Green, 1907) facing 16. With the advent of European fishermen in the region, canvas sailcloth was sometimes substituted for the traditional coverings. Similarly, trade kettles made of copper were preferred to birch bark and wooden kettles in which water had to be boiled by heating stones and placing them in the water. By contrast, a copper or brass kettle could be placed directly over the fire. Perhaps because of their reddish colour (red may have been associated with blood and life), copper kettles also appear to have had some spiritual significance for 16th-century Mi'kmaq. 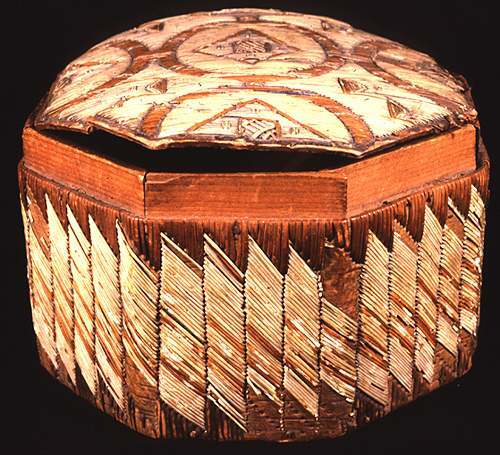 This is a fine example from the early 19th century of a Mi'kmaq birch-bark box decorated with porcupine quills. Although collected in Newfoundland, since porcupines are not found on the island, the quills would have likely come from Nova Scotia. 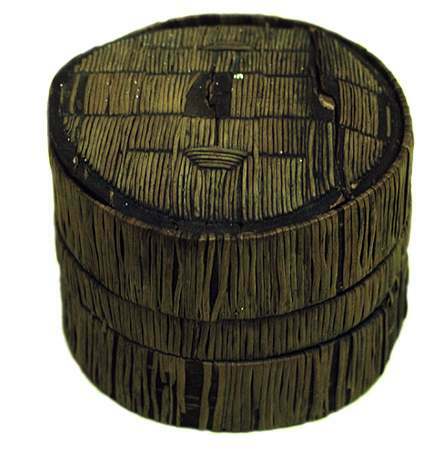 Probably from the 19th century, this example of a Mi'kmaq container is decorated with dyed spruce roots rather than porcupine quills. Aboriginal Mi'kmaq clothing was made from the skins of the animals they killed. Deer and moose skins were fashioned into leggings, sleeves, breechclouts and moccasins, all of which were worn by both men and women. In winter fur robes would be added. Skin clothing was sometimes beautifully decorated with dyed porcupine quills (largely supplanted by glass beads once the Mi'kmaq began trading with Europeans). Clothing was sewn together using deer or caribou sinew (tendons) and bone awls and needles. European traders brought metal awls and needles, which we know were much in demand by the Mi'kmaq women who made the clothing. Over time, Mi'kmaq clothes (with the exception of moccasins) tended to be made out of European trade cloth, but the Mi'kmaq long retained a style of dress that distinguished them from their Euro-Canadian neighbours. Skin robes were replaced by wool blankets, which by the 19th century were (for men) in turn replaced by military-style greatcoats. Women came to wear woolen jackets, skirts, and in the 19th century, the large, unusual-looking peaked caps, often ornamented with the distinctive double-curve motif. We know more about traditional Mi'kmaq material culture than we do about their traditional beliefs. Because French Catholic missionaries had been working among the Mi'kmaq since 1611, it is certain that some elements of the pre-European belief system were lost before they were recorded. Nonetheless, it is possible to partially reconstruct the way Mi'kmaq people looked at the world. It is likely, for example, that the Mi'kmaq did not make a distinction, as Europeans did, between what was natural and what was supernatural or spiritual. On the contrary, not only people, but animals, the sun, rivers, or even rocks, could have a spirit--could be a person. The sun had special significance, but the Mi'kmaq believed that all the universe was filled with a spirit called mntu or manitou. 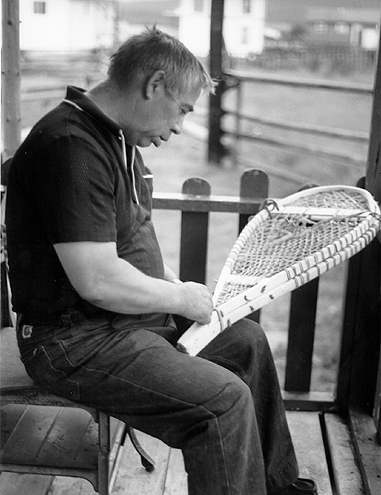 The universe had become understandable to the Mi'kmaq in part because of Glooscap or Klu'skap, who taught the people how the world had come into being and how it worked now. In the 19th century, a Nova Scotia Baptist missionary named Silas Rand collected many of the oral traditions of the Mi'kmaq, including a number of tales recounting Glooscap's exploits. Like most hunter-gatherer peoples, the Mi'kmaq had shamans, religious specialists, who lived among them. These individuals, called puoin, had the power to cure ills (and to cause them), and they were relied upon to interpret the spiritual world to the people. Although Christian missionaries tried to discredit the puoin and the world-view that they represented, many traditional beliefs and practices persisted, some down to the present day. Today, Mi'kmaq culture has changed considerably since the days when the first European vessel arrived off the shores of Mi'kmaq country, but we should remember that all cultures, including our own, change over time, and today's Mi'kmaq are no less Indian simply because they wear the same clothes as other Canadians, drive cars, and watch television. Glooscap still lives in today's Mi'kmaq.